UT Dallas Women’s Soccer ID Camp is a 3-day summer camp targeted towards young females between 15-18 years old, who wants to try to experience the college soccer athlete-student life in a nationally ranked college environment. The camp will take place at UT Dallas’ campus. The UT Dallas is a university who doesn’t follow traditions and is positioned as one of the greatest universities in the world. It’s a modern research facility which creates global leaders, innovative thinkers and attracts Nobel laureates. UT Dallas is a flexible institution that offers programs which attract top students and build strong alliances with business and industry. UT Dallas has 141 degrees to choose from, where their programs in science, math, and engineering attract some of the brightest minds and their business school is ranked as being at the top of the state. It is also ranked in top 100 over universities where you get the most for your tuition in the US. The camp staff consists of nationally ranked and very successful coaches from UT Dallas Women’s Soccer team. Head Coach Kanute Dragun is entering his 3rd season as head coach for the team and is one of the most winningest coaches in NCAA Division 3 women’s soccer history. He has led the teams to two semifinals in the ASC and an overall record. Assistant Coach Sterling Mueller who was part of three NCAA Division I National Championship teams during her career also helped UNC to four straight Atlantic Coast Conference titles, serving on the squad’s Leadership Council. Assistant Coach Casey Loyd was a three-time NCAA Division I National Champion and named the NCAA D-I Women’s Soccer Player of the Year as a senior. UT Dallas Women’s Soccer ID Camp is a camp that lets campers experience an authentic college level training environment. Campers will get the opportunity to play with and against current and former players from UT Dallas Women’s Soccer team during the camp. Included in the camp is: residential overnight stays and campus dining experience, a campus tour, and a UT-Dallas Informational Presentation with a Q & A with UT-Dallas faculty professors. 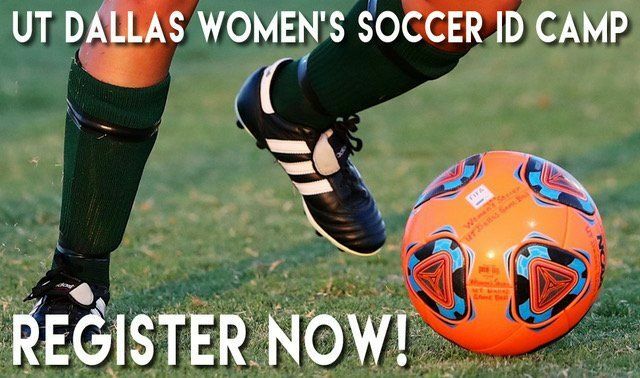 UT Dallas Women's Soccer holds its ID Camps this summer for girl players between 9th-12th grade. The UT-Dallas coaching staff will train the campers.